(MP206). Frank Watson Wood (1862-1953). Watercolour signed and dated 1913 and inscribed "HMS ST VINCENT"..
Standard size (the size of the original): 24.5 x 13 ins (62 x 33 cms) approx. HMS St VINCENT was, when laid down in the last few days of 1907, the first Dreadnought battleship designed to mount the new 50 calibre 12 inch gun. This gave her shells greater penetrating power over the earlier 45 calibre guns (a further half inch of steel could be pierced at 3,000 yards) and a higher muzzle velocity: significant gains and the ships of the class, COLLINGWOOD, VANGUARD and St VINCENT were widely welcomed when they joined the Home Fleet between February and May 1910. With DREADNOUGHT, BELLEROPHON, SUPERB and TEMERAIRE already in service the arrival of these three St Vincents now brought Great Britain’s dreadnought battleship strength up to seven  and to those with an eye on Germany’s battleship building rate, numbers mattered! 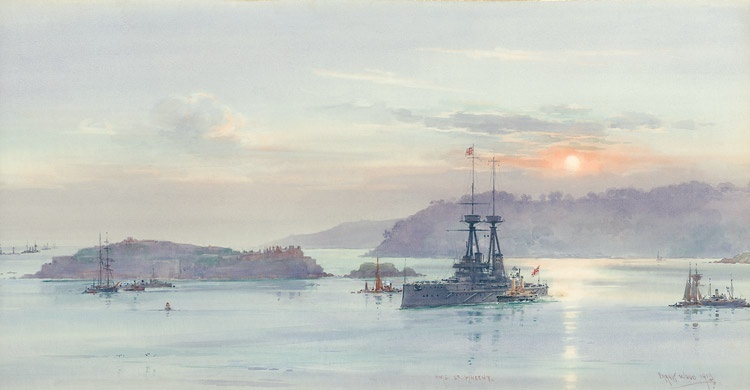 Three years later the great battleship, who had started her second commission on 28th May1912, is pictured by Frank Watson Wood as she departs from the naval base of Devonport. We are looking from the vicinity of Plymouth Hoe and Smeaton’s Tower out across the Drake Channel towards a westering sun: heavily wooded Mount Edgcumb and Cremyll lie silhouetted against the sun’s glitter. HMS St VINCENT (Captain W W Fisher MVO RN), wearing the flag of the Rear Admiral First Battle Squadron, Rear Admiral The Hon Somerset Gough-Calthorpe CVO CB, has passed south through the Narrows, turned hard to port to round the Vanguard Bank and is now steering an easterly course down the centre of Drake Channel leaving Drake Island and a small cluster of ships including a torpedo boat destroyer, to starboard. The Navigating Officer, Commander Caspar Ballard, and his captain, William Wordsworth Fisher (for so respected and charismatic was this old seadog that even the lower deck knew those first names of the Old Man! ), together with the pilot provided by the King’s Harbour Master, are gathered around the pelorus on the navigating bridge directing the course of the 23,000 ton dreadnought. Her four shafts did bestow an undoubted dexterity but a shaft horse power of only 24,500 when set against a voluminous armoured hull, considerable windage (exacerbated by those impossibly tall tripod masts!) and a draft close to 30 feet meant that there was little room for error if the ship was to be kept in safe water. Hence the dockyard paddle tug tucked up alongside to port: should the bridge team sense that the ship was starting to stray out of the navigable channel then a quick shout and a gesture over the port bridge wing would bring those powerful paddles to the rescue. Still ahead lie the two north/south channels that give access for big ships to the broader waters of Plymouth Sound and the open sea, the Asia Pass and to the east of that, Smeaton Pass. Its a long drawn out departure for heavies at the best of times and although conditions this evening appear to be pleasantly benign, there is no room for error and the bridge team must keep St VINCENT on her pre-planned tack is she is to avoid touching bottom. Other capital ships - pre-dreadnoughts by the look of things - have already reached the southern end of the Sound and can be seen over on the left filing past the breakwater and out into the open sea. Dated 1913, the painting was clearly executed in the summer months as trees are in leaf and the sun this evening is high: in just over a year’s time St VINCENT and the rest of the Royal Navy’s fleets at home and abroad would find themselves at war. By then a further 15 new dreadnought battleships would have followed the St Vincents into commission - not to mention the half dozen or so battle cruisers and plethora of smaller warships also completed since 1910  testament indeed to the extraordinary effort devoted to trying to outbuild the Kaiser’s fleet that lay across the North Sea! Frank Watson Wood’s paintings appear thick and fast in Maritime Originals & Maritime Prints' portfolios because he was not only good but very prolific too! He was especially successful at capturing scenes such as this one  his eye for ships’ details is always good (he was a draughtsman after all) and he does paint glassy calm seas and colourful skies with that particularly appealing style he made his own. His output was prodigious though he didn’t always use the best of papers it seems for many of his paintings of this period – some around a century old now – have become foxed and faded: not so this one which is in pristine, bright and unfaded condition. Wood, who received an impressive number of Royal commissions - died in 1953 at the ripe old age of 91.